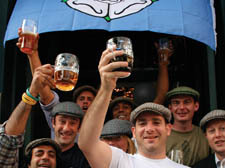 DRINKERS doffed their flat caps and raised their ale jars at a Belsize Park pub last night (Wednesday) to celebrate that county of puddings, forthrightness and Geoffrey Boycott known as Yorkshire. The bunting and cottage pies were rolled out at The Washington Pub in England’s Lane, while the Emmerdale theme tune blared out on the stereo and White Rose flags hung from the awnings. He then rushed off to make batter for the Yorkshire puddings.